Are you hooked on social networking? Want a fast and effective way to break its hold on you? Technology does make our lives a little easier, but it needs to be used in moderation. Otherwise we end up living in a fantasy world, without any real friends or companions, and without the social skills we need to survive. 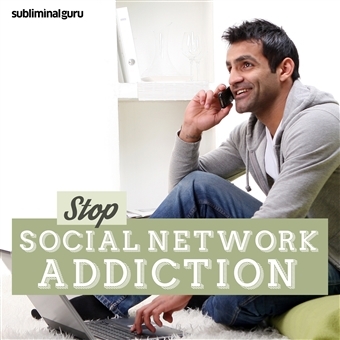 With the Stop Social Network Addiction subliminal session, you'll find the strength to resist visiting social network sites! As you listen, thousands of powerful positive affirmations will alter your thinking, helping you take back control of your time. You'll start to spend less time online, finding satisfaction and fulfillment in the real world with real people. You'll recognize the small part social networks play in your life, able to limit your online activities with ease. Steer clear of social networks! Download the Stop Social Network Addiction subliminal audio now to kick the habit for good. I enjoy living my life off the Internet. I can avoid visiting social network sites. My life offline is fun and fulfilling. I limit my visits to social network sites. I enjoy a satisfying social life in the real world. I am in control of how I spend my time. I enjoy my time away from the Internet. I easily resist visiting social network sites. Being online is only a small part of my life. I have unwavering willpower and determination. I use my time wisely throughout the day. I am stronger than any habit or addiction.